VoltDB is not like traditional database products. Each VoltDB database is optimized for a specific application by partitioning the database tables and the stored procedures that access those tables across multiple "sites" or partitions on one or more host machines to create the distributed database. Because both the data and the work is partitioned, multiple queries can be run in parallel. At the same time, because each site operates independently, each transaction can run to completion without the overhead of locking individual records that consumes much of the processing time of traditional databases. Finally, VoltDB balances the requirements of maximum performance with the flexibility to accommodate less intense but equally important queries that cross partitions. The following sections describe these concepts in more detail. In VoltDB, each stored procedure is defined as a transaction. The stored procedure (i.e. transaction) succeeds or rolls back as a whole, ensuring database consistency. By analyzing and precompiling the data access logic in the stored procedures, VoltDB can distribute both the data and the processing associated with it to the individual partitions on the cluster. 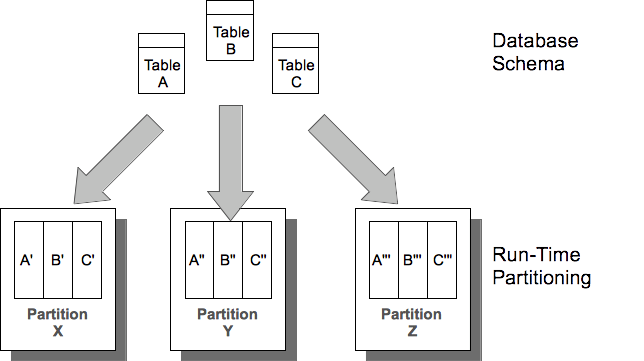 In this way, each partition contains a unique "slice" of the data and the data processing. Each node in the cluster can support multiple partitions. 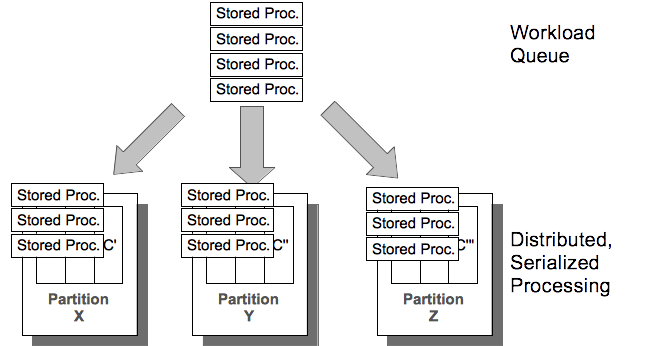 At run-time, calls to the stored procedures are passed to the appropriate partition. When procedures are "single-partitioned" (meaning they operate on data within a single partition) the server process executes the procedure by itself, freeing the rest of the cluster to handle other requests in parallel. By using serialized processing, VoltDB ensures transactional consistency without the overhead of locking, latching, and transaction logs, while partitioning lets the database handle multiple requests at a time. As a general rule of thumb, the more processors (and therefore the more partitions) in the cluster, the more transactions VoltDB completes per second, providing an easy, almost linear path for scaling an application's capacity and performance. When a procedure does require data from multiple partitions, one node acts as a coordinator and hands out the necessary work to the other nodes, collects the results and completes the task. This coordination makes multi-partitioned transactions slightly slower than single-partitioned transactions. However, transactional integrity is maintained and the architecture of multiple parallel partitions ensures throughput is kept at a maximum. It is important to note that the VoltDB architecture is optimized for total throughput. Each transaction runs uninterrupted in its own thread, minimizing the individual latency per transaction (the time from when the transaction begins until processing ends). This also eliminates the overhead needed for locking, latching, and other administrative tasks, reducing the amount of time requests sit in the queue waiting to be executed. The result is that for a suitably partitioned schema, the number of transactions that can be completed in a second (i.e. throughput) is orders of magnitude higher than traditional databases. 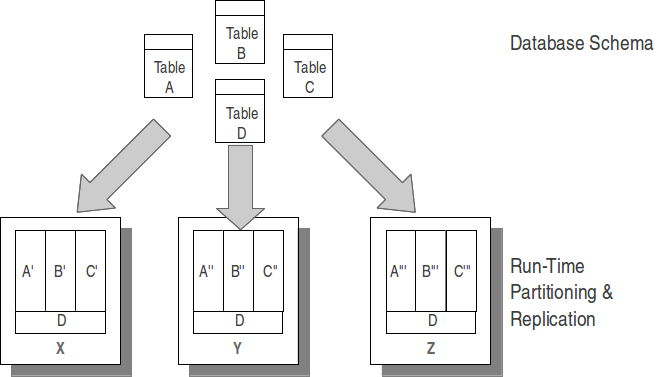 Tables are partitioned in VoltDB based on a column that you, the developer or designer, specify. When you choose partitioning columns that match the way the data is accessed by the stored procedures, it optimizes execution at runtime. To further optimize performance, VoltDB allows certain database tables to be replicated to all nodes of the cluster. For small tables that are largely read-only, this allows stored procedures to create joins between this table and another larger table while remaining a single-partitioned transaction. For example, a retail merchandising database that uses product codes as the primary key may have one table that simply correlates the product code with the product's category and full name, Since this table is relatively small and does not change frequently (unlike inventory and orders) it can be replicated for access by all partitions. This way stored procedures can retrieve and return user-friendly product information when searching by product code without impacting the performance of order and inventory updates and searches. The VoltDB architecture is designed to simplify the process of scaling the database to meet the changing needs of your application. Increasing the number of nodes in a VoltDB cluster both increases throughput (by increasing the number of simultaneous queues in operation) and increases the data capacity (by increasing the number of partitions used for each table). Save the database (using a snapshot), then restart the database specifying the new number of nodes for the resized cluster and using restore to reload the schema and data. Add nodes "on the fly" while the database is running.